root_squash: Prevents root users connected remotely from having root privileges and assigns them the user ID for the user nfsnobody. This effectively "squashes" the power of the remote root user to the lowest local user, preventing unauthorized alteration of files on the remote server. Alternatively, the no_root_squash option turns off root squashing. To squash every remote user, including root, use the all_squash option. To specify the user and group IDs to use with remote users from a particular host, use the anonuid and anongid options, respectively. 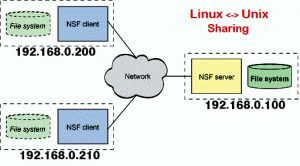 In this case, a special user account can be created for remote NFS users to share and specify (anonuid=,anongid=), where  is the user ID number and  is the group ID number. no_root_squash: By default, any file request made by user root on the client machine is treated as if it is made by user nobody on the server. (Exactly which UID the request is mapped to depends on the UID of user "nobody" on the server, not the client.) If no_root_squash is selected, then root on the client machine will have the same level of access to the files on the system as root on the server. This can have serious security implications, although it may be necessary if you want to perform any administrative work on the client machine that involves the exported directories. You should not specify this option without a good reason. sync: By default, all but the most recent version (version 1.11) of the exportfs command will use async behavior, telling a client machine that a file write is complete - that is, has been written to stable storage - when NFS has finished handing the write over to the filesystem. This behavior may cause data corruption if the server reboots, and the sync option prevents this. See Section 5, “Optimizing NFS Performance” for a complete discussion of sync and async behavior.